Let’s shift up women’s representation! At the rate we’re going—with women representing only 20 percent of Congressional seats—we aren’t predicted to reach parity until 2121. The Washington Post writes that this estimation is on par with when humans are expected to begin setting up colonies on the moon. We can’t wait 107 years to ensure women’s voices are equally represented in the halls of government. That road is too long. It’s time to shift gears. Political Parity is putting the pedal to the metal. 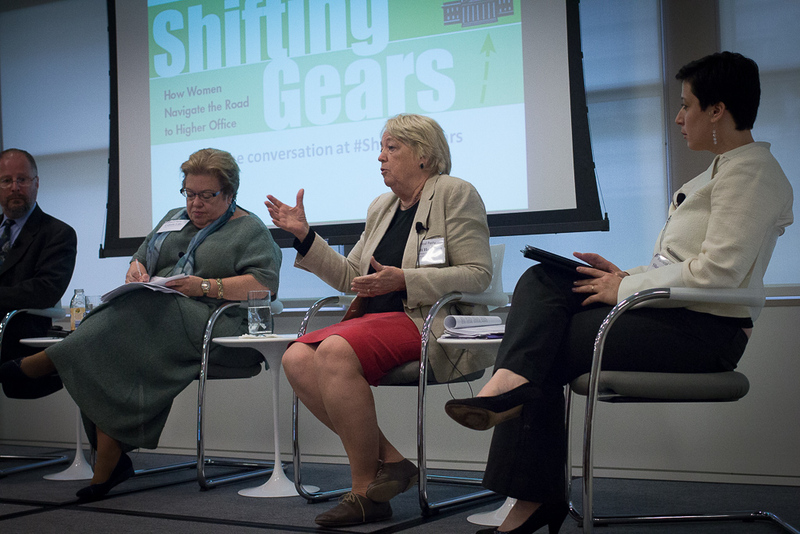 On May 21, Parity and the Institute for Women’s Policy Research (IWPR) launched Shifting Gears: How Women Navigate the Road to Higher Office, a report exploring how women build political careers. We were joined by researchers Bob Carpenter of Chesapeake Beach Consulting, Heidi Hartmann of IWPR, Celinda Lake of Lake Research Partners, and Shauna Shames of Parity. Lake emphasized that the biggest barrier hindering women from seeking and securing public office is lack of access to well-resourced networks. Shames added that because of hyperpartisanship and the lack of diversity among current officeholders, women are less likely than their male counterparts to see politics as an avenue to address issues of importance to them. This disconnect between politics and positive change is deterring women’s candidacies. Transitioning into the importance of women’s voices in office, Assemblywoman Caroline Casagrande (R-NJ) hit on a key finding in Shifting Gears research: motherhood is a motivator. “Do I think about [my kids] every time I turn in a bill?” she asked. “Absolutely.” So few mothers, she explained, are serving in office. “We need more women going through that stage of their life [in politics],” she added. She the People featured the report findings and charts, focusing on women’s initial motivations to run, barriers to running, and strategies employed by female politicians on the campaign trail. On Leadership highlighted our key finding that just 35 percent of female legislator respondents considered politics a career, and also addressed women’s lack of party support and limited access to informal networks for fundraising. The Fix turned its attention to Senate primaries, citing what women in politics literature knows so well: when women run, women win. But not many women are running. #ShiftingGears spurred a lively conversation on Twitter, engaging scores of activists, researchers, and media outlets to spotlight women’s underrepresentation. We need your voice. What can you do? Visit and share the Shifting Gears research page on Parity’s website with the hashtag #ShiftingGears. Read, comment on, and share Shifting Gears coverage: She the People, On Leadership, The Fix, and The Daily Beast. Incorporate Shifting Gears research into your curriculum or organization’s programming, if applicable. Join Political Parity in accelerating women’s electoral progress. We’re not waiting for 2121. Marni Allen is the director of Political Parity, a program of the Hunt Alternatives Fund. Political Parity is a nonpartisan platform for accelerating the energies of passionate and dedicated leaders, researchers, and funders changing the face of US politics.